Founded in the 6th century BC, the ancient city of Agrigento has always been one of the most important centers of the Mediterranean. 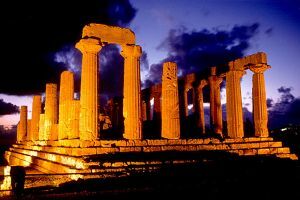 The well-preserved Doric Temples are one of the most striking traces of Greek civilization in Sicily. The imposing white outlines dominate the valley, bearing witness to the magnificence and supremacy of the ancient city. The 7 islands composing the archipelago are all volcanic in origin and have given volcanologists the opportunity to broaden their knowledge. The Baroque Cities of the Noto Valley (2002), rebuilt in the Baroque style after the earthquake in 1693. Syracuse and the Cave Necropolis in Pantalica (2005), which includes two sites that bear witness to the Greek and Roman civilizations. Mount Etna (2013), included because of its immense geological, scientific, and cultural value, its millennial volcanic activity, and its fundamental role in the Mediterranean area. The Arab-Norman Circuit (2015). The Arab-Norman architectural itinerary, included in the list because of the cultural and social syncretism it represents, unwinds between Palermo, Cefalù, and Monreale. It includes nine civil and religious monuments, seven of which are in Palermo alone: Palazzo Reale and the Palatine Chapel, the San Giovanni degli Eremiti church, the Santa Maria dell’Ammiraglio church (aka Martorana), the San Cataldo church, the Palazzo della Zisa, the Ponte dell’Ammiraglio, the Cathedral (all of these are in Palermo); the Cathedral in Cefalù and the Duomo in Monreale. There is an excellent and very well organized website where you can find all the info you might need.